Yevgeny Sudbin has been hailed by The Telegraph as ‘potentially one of the greatest pianists of the 21st century’. His many recordings for BIS have met with critical acclaim and are regularly featured as CD of the Month by BBC Music Magazine or Editor’s Choice by Gramophone. In 2016 he was nominated as Gramophone Artist of the Year. Highly praised as a concert soloist, Sudbin has in recent seasons worked with the Philharmonia Orchestra, Rotterdam Philharmonic Orchestra and Montreal Symphony Orchestra, as well as the Minnesota Orchestra, the BBC and Royal Liverpool Philharmonic orchestras, Luzerner Sinfonieorchester, Czech Philharmonic and Australian Chamber Orchestra. He performs regularly in prestigious venues such as the Royal Festival Hall and Queen Elizabeth Hall (International Piano Series), the Zürich Tonhalle, Amsterdam Concertgebouw (Meesterpianisten) and Avery Fisher Hall in New York. 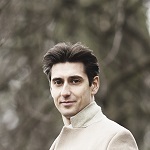 Yevgeny Sudbin has collaborated with eminent conductors including Neeme Järvi, Vladimir Ashkenazy, Osmo Vänskä, Mark Wigglesworth, Andrew Litton and Vassily Sinaisky. In addition, his love of chamber music has led to partnerships with musicians such as Alexander Chaushian, Ilya Gringolts, Julia Fischer, the Chilingirian Quartet, Johannes Moser and Vadim Gluzman. Appearances at festivals include Aspen, Mostly Mozart, Tivoli, Nohant and Verbier. Born in St Petersburg, Yevgeny Sudbin began his musical studies at the Specialist Music School of the St Petersburg Conservatory with Lyubov Pevsner at the age of five. He emigrated with his family to Germany in 1990 where he continued his studies at Hanns Eisler Musikhochschule. In 1997 Sudbin moved to London to study at the Purcell School and subsequently the Royal Academy of Music under Christopher Elton. In 2010, he was awarded a fellowship by the Academy and he is now a visiting professor. He lives in London with his wife and three young children and, in his spare time, he is an avid photographer. For further information please visit Yevgeny Sudbin's website.